Chicana. Goth. Dykling. Desiree Garcia knows she's weird and a weirdo magnet. To extinguish her strangeness, her parents ship her to Saint Michael's Catholic High School, then to Mexico, but neurology can't be snuffed out so easily: Screwy brain chemistry holds the key to Desiree's madness. As fellow crazies sense a kinship with her, Desiree attracts a coterie of both wanted and unwanted admirers, including a pair of racist deathrock sisters, a pretty Hispanic girl who did time in California's most infamous mental asylum, and a transnational stalker with a pronounced limp. As high school graduation nears, Desiree's weirdness turns from charming to alarming. Plagued by increasingly bizarre thoughts and urges, Desiree convinces herself she's schizophrenic, despite assurance otherwise. In college, she finds Rae, an ex-carnie trannyboi, who becomes the June Carter to her Johnny Cash. With Rae's help, Desiree answers the riddle of her insanity and names her disease. Combining the spark of Michelle Tea, the comic angst of Augusten Burroughs, and the warmth of Sandra Cisneros, Mexican American author Myriam Gurba has created a territory all her own. 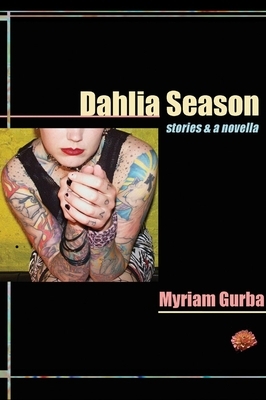 Dahlia Season not only contains the title novella, but also several of Gurba's acclaimed stories. Myriam Gurba is a high school teacher who lives in Long Beach, California, home of Snoop Dogg and the Queen Mary. She graduated from UC Berkeley, and her writing has appeared in anthologies like The Best American Erotica (St. Martin's Press), Bottom's Up (Soft Skull Press), Secrets and Confidences (Seal Press), and Tough Girls (Black Books). Myriam Gurba's writing has appeared in many anthologies including Best American Erotica (St. Martin's), Bottom's Up (Soft Skull), Secrets and Confidences (Seal), and Tough Girls (Black Books). A graduate of UC Berkekley, Gurba is currently a high school teacher living in Long Beach, California, home of Snoop Dogg and the Queen Mary.